Waldorf Astoria NYC Wedding Photos capture the essence of the dream New York City wedding. The luxury hotel was built in 1931 and remains a Manhattan classic to this day. 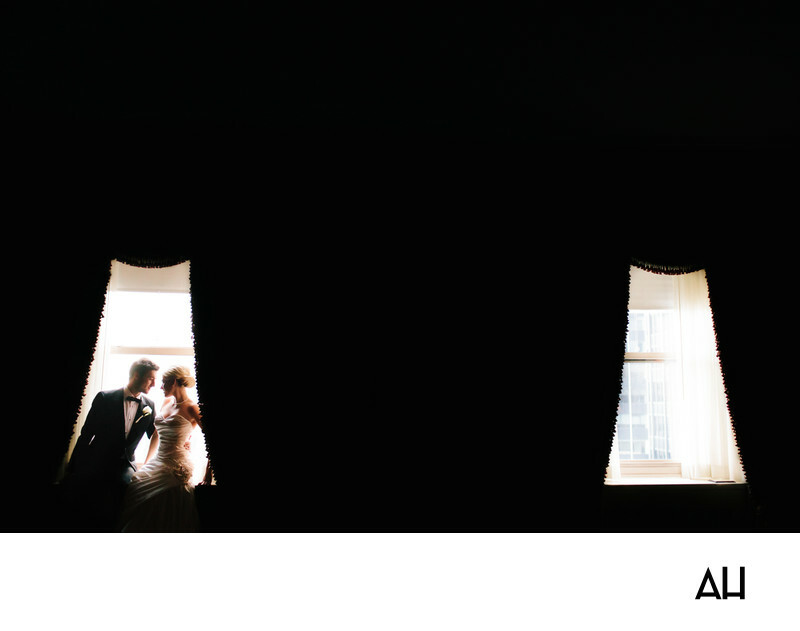 The splendor of the building makes it a perfect spot to hold a formal, black tie wedding. The couple pictured above chose to add their wedding day to the legacy of the venue. High above the hustle and bustle of the city, the future Mr. and Mrs. steal a moment alone before the celebration begins. The pair looks glamourous in a black tux and simple, yet elegant gown. They have planned and waited for this day to come, and now they are able to exhale and take in each second of it. This picture of pair sitting in the glow of their marriage, is one that they will surely cherish. The symmetry of the sun-lit windows draws attention to the couple, who sit quietly in the presence of their love. The image shows a prelude to a kiss shared between the two, as the bride and groom take time to enjoy a peaceful moment together on a day that is full of joy, but can also be very busy. Many Waldorf Astoria NYC Wedding Photos show the grandeur of the venue, which does produce beautiful images. This image, though, focuses solely on what the wedding day is truly about, the love between the bride and groom.